06.03.2017, a glorious era of INS Viraat being the flag ship of the Indian Navy came to an end. INS Viraat, the second Centaur-Class aircraft carrier in service which has spent 30 years in the Indian Navy and 27 years in the Royal Navy, was decommissioned on the day, in a solemn yet grand ceremony at Naval Dockyard, Mumbai. 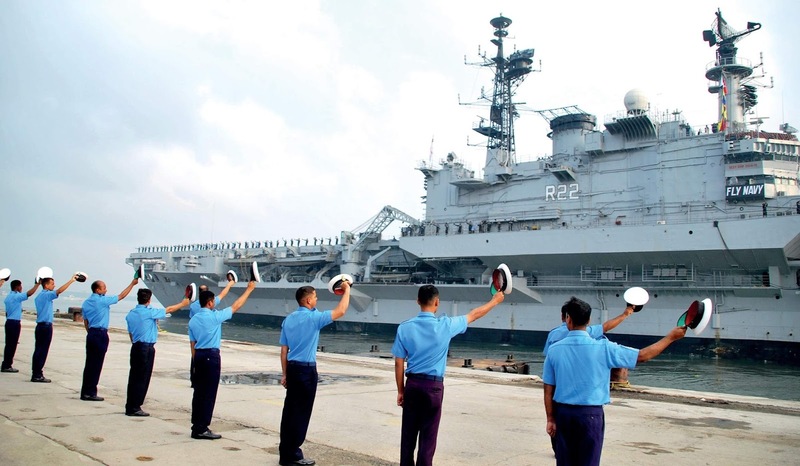 The decommissioning ceremony was attended by more than 1300 personnel who have served on board INS Viraat. Admiral Sir Philip Jones, KCB, ADC, First Sea Lord and Chief of Naval Staff of Royal Navy, Vice Admiral Vinod Pasricha, PVSM, AVSM, NM the commissioning Commanding Officer of INS Viraat were the guests of honour, while Admiral Sunil Lanba, PVSM, AVSM, ADC, Chief of the Naval Staff, was the Chief Guest for the ceremony. To commemorate “30 years of Glorious Service to The Nation” by INS Viraat, a Special Postal Cover was released by the Chief Guest on the occasion. INS Viraat holds the world record as mentioned in the Guinness Book of records for being the longest serving warship of the world. The ship which was the centerpiece of the Navy, housed the fighters Sea Harriers of INAS 300, popularly called “White Tigers”, Anti Submarine aircraft Sea king Mk 42B - also known as “Harpoons” -, Sea King Mk 42 C and the SAR helicopter Chetak as an integral flight. The indigenous Advance Light Helicopters ‘Dhruv’ and the Russian twin rotor Kamov-31 have also operated from the ship. The Sea Harrier fleet was decommissioned at Goa on 11 May 2016. Under the Indian Flag, the ship has clocked more than 22,622 flying hours by various aircraft in the past three decades and has spent nearly 2252 days at sea sailing across 5,88,287 nautical miles (10,94,215 KM). This implies that Viraat has spent seven years at sea, circumnavigating the globe 27 times. Since her inception, she has had a total of 80,715 hours of boilers running. Viraat played a major role in Operation Jupiter in 1989 during the Sri Lankan Peacekeeping operation, after which she was affiliated with the Garhwal Rifles and Scouts of the Indian Army in 1990. She also saw action during Op Parakram in 2001-2002, post the terrorist attack on Parliament. The ship was instrumental in honing the art of flying operations from a carrier deck in the Navy, which also resulted in seamless induction of INS Vikramaditya and its integration with the fleet. The ship has participated in various international joint exercises like Exercise Malabar (USA), exercise Varuna (French), Naseem-Al-Bahar (Oman Navy). She has also been an integral element of all annual theater level exercises (TROPEX). The last operational deployment of Viraat was for the International Fleet Review (IFR 2016) off Vishakhapatnam in Feb 2016. ‘Mother’, as she was fondly referred to in the Navy, had been commanded by 22 Captains since 1987. She was the Flagship of the Navy since her inception. Around 40 Flag officers including five Chiefs of Naval Staff were raised and groomed in her lap. Her legacy under the Royal flag was no less. As HMS Hermes, she was commanded by 13 Captains of the Royal Navy. Her role in Operation Mercy in 1974 and the Falklands War in 1982 are now textbook references for future navies. As part of the decommissioning ceremonies, a Barakhana for retired and serving sailors and their families was held on 04 March 2017 and a ceremonial dinner were held on 05 March 2017. During these functions, nineteen personnel comprising officers, sailors as well as civilians, and personnel from Garhwal Rifles and Hermes Association were felicitated for notable services onboard. At sunset on 06 March 2017, as the Naval Ensign and Commissioning Pennant was lowered for the last time onboard INS Viraat, a glorious era in the history of the Indian Navy came to a nostalgic end. The legacy of Viraat will live on forever and will be carried forward by INS Vikramaditya, which is already integrated with the fleet, and INS Vikrant which will be inducted in the next few years.